You've just gotta check this out! 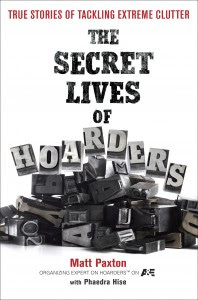 My friend, Matt Paxton, the owner of Clutter Cleaner and of A&E's "Hoarders" fame has written a book! It is officially available to purchase today. As a friend of Matt's, I actually got a copy a couple of weeks ago with a personal inscription and all that jazz. The timing of the book arriving with such a sincere, touching inscription from the author will never be lost on me as it was the same day I learned of my cousin's passing. Although the title of the book has a sensationalist ring to it, what you will find within its pages is sound advice with deep respect for those affected by hoarding, their family and loved ones, as well as the community at large. Matt defers on some topics to Dr. Suzanne Chabaud, Ph.D. from the OCDINGO in New Orleans and also a featured expert on "Hoarders".